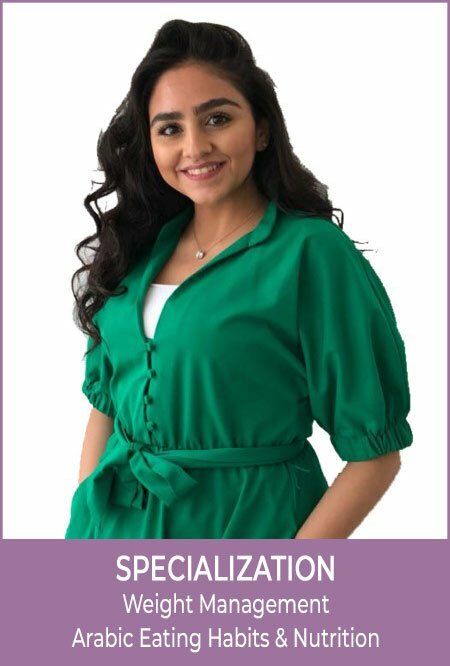 Lima is a licensed dietitian with a bachelor’s degree in Clinical Nutrition and Dietetics from University of Sharjah. Her journey began with a wide training in one of the best multi-specialty hospitals in Jordan. She is specialized in weight management, Arabic eating habits and Arabic Cuisine. With her fresh attitude in the nutrition world, Lima is always trying to gain new knowledge in the field and to make good health and nutrition a desired goal for everyone around her! Lima believes that nutrition is much more than a fixed diet and a strict routine! For that reason, she works with people with a desire to make them reach a healthier lifestyle, and assists them in reaching their goal steadily, with the right approach in nutrition. To her, food is a friend, and when you choose the right friend, you can rely on it to better your life! That is the message Lima works on delivering to the people she works with. “Nothing looks good as healthy does.” This is a saying that Lima lives by and helps people believe in. When you look good and feel good, it gives you confidence; this is the golden key Lima makes sure her clients gain throughout their journey! Lima enjoys a challenge, and when she’s not working to help others, she spends her time finding out new ways to maintain her nutritional journey, enhance it and have fun at the same time! Of course, she is never shy to encourage people around her to join!